Private browsing is all the rage with browsers these days. Once you go into private browsing mode, you can traverse the internet without leaving a trail. Your history? Deleted. Your cookies? Destroyed. Your bookmarks and non-private history? Preserved for when you come back to the surface. If you don't wanna know anyone that which sites you had visited than this option is far better than deleting the history with all other content. Tip:This method is very useful for the ONLINE for BANKING USERS. NOTE:Private Browsing does not make you anonymous on the Internet. Your internet service provider, employer, or the sites themselves can still track the pages you visit but their is no record on your browser. Visited pages: No pages will be added to the list of sites in the History menu, the Library window's History list, or the Awesome Bar address list. Download List entries: No files you download will remain in the list in the Downloads window after you turn off Private Browsing. Cookies: Cookies are file​s created ​by websites​ that​ store information ​on your​ computer​, such​ as your​ preferences ​when​ visiting​ a certain site​. These will​ not ​be stored. For more information on cookies, see Cookies. Web cache files: No temporary Internet files or cached files from web pages will be saved until you turn off Private Browsing. What does Private Browsing save? 1) If you create new Bookmarks while using Private Browsing, they will not be removed when you stop Private Browsing. 2) If you save files to your computer while using Private Browsing, those files will not be deleted when you stop Private Browsing. However, any files you open in an external application will be cleared from the system's temporary folder, and none of the files you download will appear in the Downloads window list. In Chrome for a private browsing Mode, A Window named Incongnito Window is used. In this Window you just browse normally like any other browsers and when you will close the window,History, Cookies, Passwords and all the contents except Bookmarks and Downloaded files are automatically deleted. How to open an incognito window? You can also use the keyboard shortcuts Ctrl+Shift+N (Windows, Linux, and Chrome OS) to open an incognito window. At the top of the Firefox window, click the Firefox menu (Tools menu in Windows XP), and select Start Private Browsing. When you turn on Private Browsing, Firefox will alert you that it will save your current windows and tabs for after you finish using Private Browsing. Click on Start Private Browsing to continue. When browsing in Private Browsing mode, the Firefox menu will be purple (for Windows XP the window title will say (Private Browsing) instead) during your session. At the top of the Firefox window, click the Firefox menu (Tools menu in Windows XP), and select Stop Private Browsing. 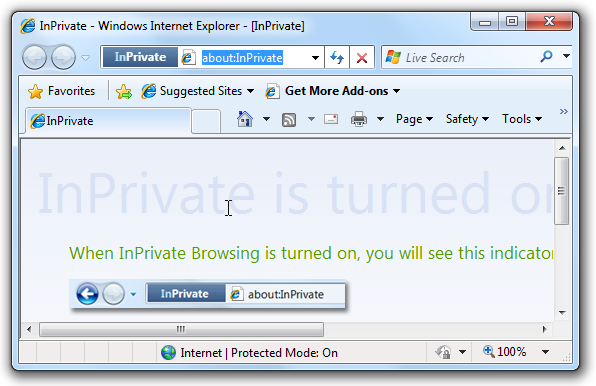 The windows and tabs you were using when you enabled Private Browsing will appear, and you can use Firefox normally. The Firefox menu will turn orange again (for Windows XP the Firefox window title will no longer say(Private Browsing)) when Private Browsing is off. Internet Explorer’s "private browsing” mode is an excellent way to hide what you’re looking at from prying eyes, but it’s normally hidden under a menu… but we can make it easier to access. 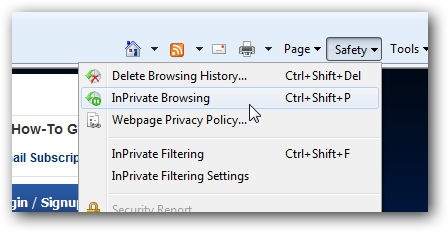 To open an InPrivate Browsing window, you can either use the Ctrl+Shift+P shortcut key, or just use the Safety \ InPrivate Browsing item on the menu. 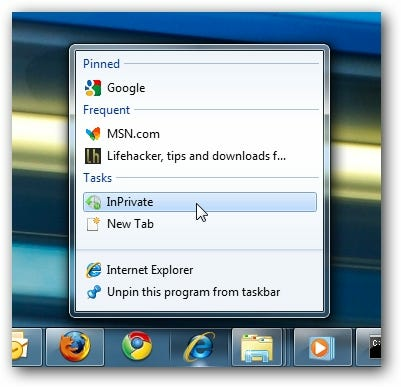 If you are using Windows 7, all you have to do is right-click on the icon in the taskbar and choose the InPrivate option. You can also click and hold the left mouse button on the icon, and slide your mouse up… the menu will pop up and you can choose it there.